SAVE AN ACRE OF OUR GALLATIN FRONT!!! YOUR DONATION will contribute to Saving an Acre for every $1,000 received. that the Limestone West Conservation License will protect. YOUR $250 turns into $500 and you Save ½ an Acre of Our Gallatin Front! YOUR $500 turns into $1,000 and you Save an Acre of Our Gallatin Front!! YOUR $1,000 turns into $2,000 and you Save 2 Acres of Our Gallatin Front!!! Larger donations are also needed and gratefully accepted! YOUR DONATIONS* Are What Make Saving Our Gallatin Front Possible! 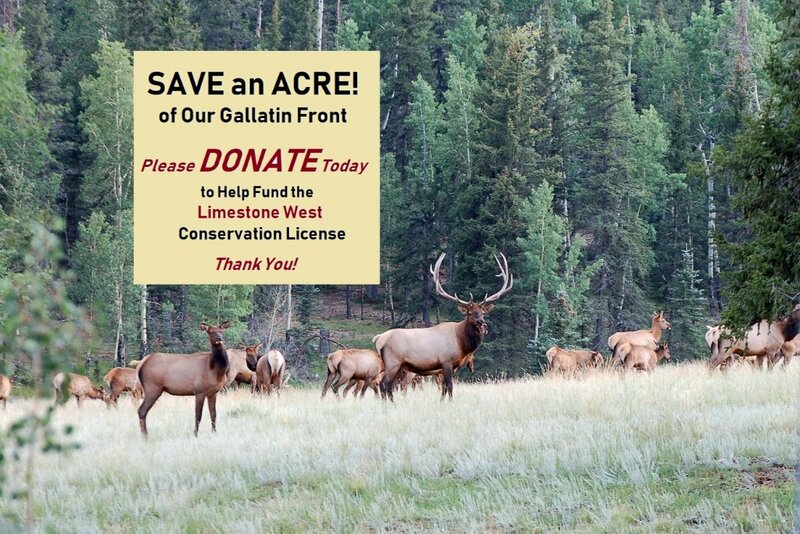 Please help us in preserving the last roadless wildlife habitat that connects the Gallatin Valley to the Greater Yellowstone Ecosystem! Donate TODAY to save Limestone West! * Save Our Gallatin Front is a 501(c)(3) non-profit organization (pending). Any excess fund that SOGF has once all cost associated with the Conservation License are covered will be donated to other Bozeman conservation organizations. The Board of Directors of Save Our Gallatin Front, Inc. (SOGF) wishes to thank you for your support to save the Limestone West area of the Gallatin front. Together we ensured that the Gallatin Valley’s last roadless wild life habitat that connects us to the Greater Yellowstone ecosystem will remain the special place that it is today. SOGF has executed the 25-year Conservation License with the Montana DNRC along with making the full payment for the License and the required Forest Improvement Fees. Going forward, SOGF’s role will be to maintain and monitor the Conservation License, purchase the insurance required by the License and take the steps necessary to remain a Montana non-profit 501(c)3 corporation in good standing. This outcome is truly an example as to what local citizens can accomplish through their volunteer efforts and commitment. SOGF will be hosting a Community Celebration on Tuesday, April 30 from 5:30 – 8:00 PM at the Triple Tree Ranch Owners’ Center (58 Triple Tree Road, Bozeman). We hope to see you on the 30th so that we can thank you personally for your support.